With the camera specialist Jessops recently going into administration, the response from the general public has been a mixed one. The question on everyone’s lips is ‘Did poor service destroy Jessops or the internet?’ Whether poor management is to blame, lack of quality customer service, or the competition from giant Internet retailers, such as Amazon, Jessops is no longer. So, what do you think led to Jessops’ decline? 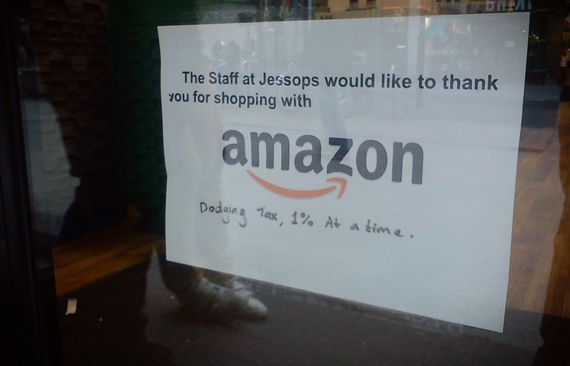 As the image indicates (as shown above) - Jessops are blaming Amazon and the general public for their demise. Yet, with so many online stores providing high quality goods at cheaper rates than high street retailers, can the general public be blamed for choosing the internet over high street stores? So far, 2013 has seen the closure of Jessops, shortly followed by music store HMV going into administration. This has led many to believe that further high street retailers will continue to close until no shops remain, but what do you think? Does this mean that there is hope for high street stores after all? That with the right adaptions, even the more traditional stores can stay afloat as long as they are willing to move with the times? Further changes in order to save the Great British high streets were advised also, as Martyn Thompson explained ‘There must be nothing to prevent people visiting towns’ and factors such as cheaper or free parking may help to entice shoppers back to high street consumerism. For now, many high street shoppers have to contend with traffic, congestion and extortionate car parking prices (some towns charge up to £9.00 a day to park). This is perhaps one of the many reasons consumers are choosing to shop online. Whether you operate your business online or offline, you need to be savvy by staying ahead of your competitors.